Alabama has nearly 23 million acres of forestland. These forest provide valuable resources which directly affect the quality of life of every Alabamian. They provide wood products that we depend on every day. These same forests also provide habitat for wildlife, clean the air, purify water, protect valuable topsoil, and provide scenic beauty and recreational opportunities. For all these reasons, Alabama's forests are vitally important. 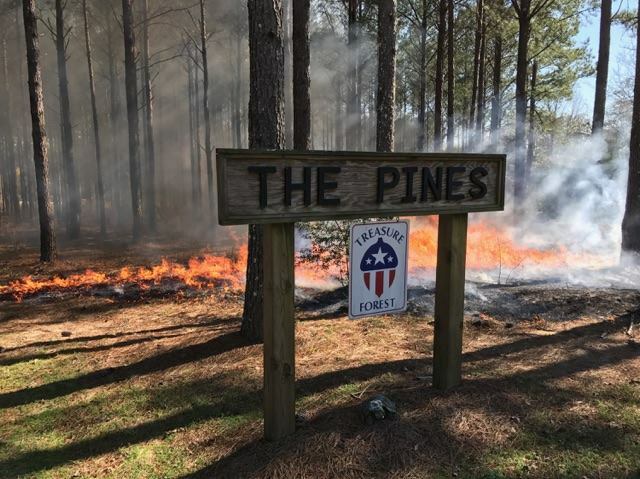 The TREASURE Forest program is a voluntary program sponsored by the Alabama Natural Resources Council and the Alabama Forestry Commission that seeks to promote sound and sustainable, multiple-use forest management. This type of management encourages landowners to use their forests wisely to meet their own objectives while at the same time protecting and enhancing the environment. If you would like a resource professional to visit your property or if you would like to nominate an Alabama Forest landowner for the TREASURE Forest Program just complete and submit the online application. What is the TREASURE Forest Award? The TREASURE Forest Award is earned by private landowners who display their commitment to the TREASURE Forest ethic through the physical management that takes place on their land. The TREASURE Forest Award includes a numbered and signed TREASURE forest certificate, a TREASURE Forest sign to display on the property, and a TREASURE Forest hat. When the award is given, the land is called a Certified TREASURE Forest and the landowner is called a TREASURE Forest landowner. TREASURE Forest and TREASURE Forest landowner are earned titles that represent good stewardship of the land, protection and/or enhancement of the multiple values of the forest, and providing benefits for both present and future generations. If you would like more information on the TREASURE Forest Program or the other management programs we use, please contact your local Alabama Forestry Commission office.